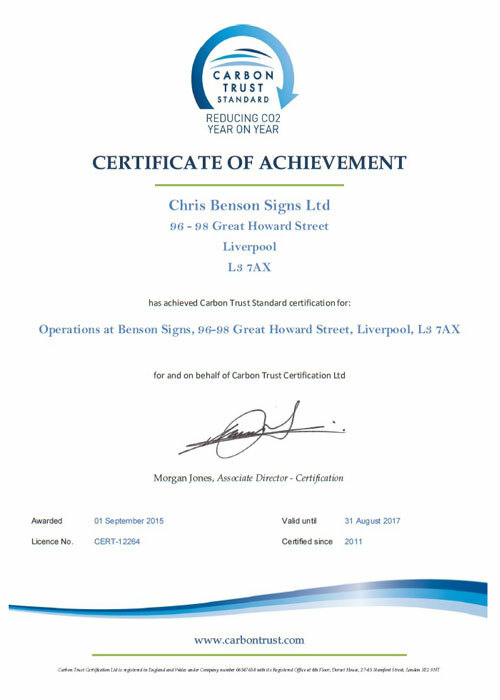 In 2011, it was with great pride that we were awarded the highly prestigious Carbon Trust Standard, a first for any UK sign manufacturer, in recognition of our commitment to achieving year on year reductions in our carbon emissions. Subsequently, we retained this award in 2013, despite an increase in the level of scrutiny of our emissions and systems. We achieved this in part as a result of the huge commitment we took in implementing our 1st biomass heating installation, and following the investment in our 1st electric vehicle. For the next 24 months we continually chipped away at our carbon emissions, always looking for new and more efficient ways of using energy. We installed a 2nd biomass system in 2014, purchased a 2nd electric vehicle in 2014, increased our onsite solar PV in December 2015, and completed a full LED lighting upgrade roll-out throughout our building in 2015. In fact, all of the items on our 2011 to-do list we completed, and more besides! These efforts have resulted in us being awarded a third Carbon Trust Standard. Since our first assessment, which required data to be analysed back to 2009, we have reduced our carbon footprint from 165 tonnes to just 95 tonnes, a whopping 42%! We feel this is a fantastic achievement, not just for ourselves and the environment, but also for our clients, as by holding this Standard we can assure them that the products we manufacture have been made using the best materials, with the least embedded energy, and employ the latest, most efficient technology to operate them, meaning lower running costs.